If you have a daily makeup routine, you are not alone. Many women apply makeup each day for different reasons. While applying your makeup, do you ever stop to think of the harm it might cause? Of course, what harm could something like a simple tube of lipstick cause? Truth be told, parabens found in your lipstick and other cosmetic products could potentially cause more harm than you realize. What Are Parabens and Why Are They Used in Lipstick? Why Are Parabens Dangerous in Lipstick? How Are Parabens Listed in Ingredients? What are Parabens and Why are They Used in Lipsticks? Parabens are a collection of preservatives commonly used in several beauty products. You will often find parabens in shampoos, antiperspirants, and even makeup, such as lipstick. Parabens and other preservatives protect products against the growth of bacteria and mold that may prove harmful to human health. While that might seem like a good thing, there is some information suggesting that parabens may also prove harmful to human health. For instance, a study performed in 2004 indicated that there were traces of parabens found in cancerous breast tissue. Parabens contain weak properties similar to estrogen, which may cause the growth of cancerous breast tissue. Of course, the amount of estrogen-like substances found in parabens is weak enough that there is nothing to link parabens to health problems definitively. However, it is enough to make people uncomfortable to the point that they prefer to use paraben free products. Parabens most likely found in your cosmetics include propylparaben, methylparaben, ethylparaben, and butylparaben. Cosmetics manufacturers believe parabens protect your makeup products from the growth of mold and bacteria. For instance, when you use lipstick, you swipe it across your lips. Manufacturers worry that moisture and saliva from your lips may cause bacteria and mold to grow. To protect lipstick from that risk, they add parabens to many lipstick products. So, if parabens protect lipstick from the growth of mold and bacteria, why are they dangerous? The Food and Drug Administration provides the most definitive answer to this question. For starters, the FDA admits that they do not regulate many of the ingredients found in cosmetics, including parabens. Aside from color additives, ingredients found in cosmetics do not require FDA approval. As previously mentioned, parabens mimic estrogen via the use of synthetic chemicals. Unfortunately, estrogen exposure, particularly lifelong exposure, can cause disruptions to your hormone system. In turn, estrogen exposure may lead to the division of breast cells, which can, in turn, lead to the growth of cancerous breast tissue. Of course, women are not the only ones at risk. Parabens may also have an impact on the male reproductive system. According to Livestrong, research suggests that exposure to parabens may significantly decrease sperm levels in males. The study focused on rats and paraben exposure. Rats who received daily exposure to parabens suffered from a decrease in the concentration of their sperm. Even more surprising is the fact that parabens may also lead to early puberty in young girls and boys. Fox News reported on the possible link discovered by scientists between the use of everyday products containing parabens and early puberty. Parabens, or xenoestrogens, commonly found in products used daily, like makeup, can mimic natural estrogen and cause early puberty to strike among adolescent boys and girls. There are, of course, parabens in other makeup products. So, what makes them so dangerous in lipstick compared to parabens in other cosmetic products? If you think about it, you do not apply other cosmetic products to your mouth. Lipstick is a product that you use specifically to alter the color of your lips. Now take it a step further and consider the fact that you often lick your lips. Also, food and beverages you consume often touch your lips. Therefore, you run the risk of ingesting parabens found in lipstick products, which makes it far more concerning. As if parabens do not seem bad enough, now you have to worry about possible ingestion when using lipstick containing parabens. Unfortunately, you are not likely to know if the cosmetics and lipsticks you use contain toxic metals. Cosmetic manufacturers are not required to report the existence of impurities, including toxic metals, found in their products. In other words, consumers such as yourself have no way of knowing the risks you face when you pick up your favorite brand of lipstick. The mixture of organic oils, vitamins, minerals, and waxes will help to keep your lips moisturized and healthy while also allowing you to avoid potential concerns with parabens. Paraben free lipsticks are a great choice for anyone. However, they are especially great for pregnant women and children who might find themselves susceptible to the possible harms of parabens. To ensure the best coverage from your paraben free lipstick, refer to the video below. As stated in the video, make sure you follow important steps for maximum coverage. You should set up a routine to exfoliate and moisturize your lips. For a fuller appearance, make sure you use a lip liner to line your lips and then proceed to fill them in. For best results, apply two coats of lipstick. Press your lips firmly together and then bloat them on a sheet of tissue. Afterward, apply one last coat of lipstick. Instead, opt to try some of the safer paraben free lipstick alternatives mentioned previously. The Glory of New York Paraben Free Lip Gloss is yet another great product that offers natural ingredients for beauty, color, and shine. The gloss contains vitamin E to help moisturize your lips throughout the day. It also has an ultra-shine sensation for that wet glossy look. The reflecting light properties of the gloss gives your lips a fuller look. Make sure you bring this lip gloss with you wherever you go so you can reapply it as necessary. The coverage is great, but it does not last as long as some other products. Still, the colors seem to shine, and it does give a nice, full appearance to your lips. It contains Beeswax, Castor Oil, Vitamin E, and other natural ingredients to help nourish your lips throughout the day. Although you should not eat your makeup, you can rest easy knowing that the natural ingredients in this lip gloss are not harmful if accidentally consumed. Expecting moms are often very wary of the ingredients they put in their bodies, so it is no surprise they would want a beauty product that is free of harmful chemicals, too. Fortunately, VSACHAR MD Pregnancy Safe Lipstick seems to be the answer. It offers the color and shine that pregnant women want and need to perk themselves up while remaining free of harsh chemicals. As any mom knows, children often want to be just like mommy. That means they will often ask to try on makeup, too. Rest easy knowing VSACHAR MD Pregnancy Safe Lipstick is safe for pregnant women and their children. If your child accidentally ingests the lipstick, do not panic. The natural ingredients in the product are not harmful if consumed. Burt’s Bees is a well-known brand name among moms and supporters of beauty products containing all-natural ingredients. 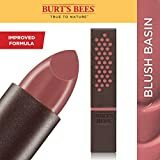 Burt’s Bees 100% Natural Moisturizing Lipstick is no exception to the rule. It contains a broad range of natural ingredients to ensure your lip wear is as good for you as it looks. You will want to take a tube of this lipstick with you for reapplication purposes. It tends to wear off a bit quickly, but it does make your lips look and feel beautiful once applied correctly. The natural ingredients are safe for you and allow you to breathe easy. In the event of accidental ingestion, you do not have to worry. The ingredients in this product are safe for consumption. If you are looking for an all-natural lipstick that offers plenty of lip protection and a beautiful range of colors, Ecco Bella FlowerColor Natural Lipstick may be just what you need. It comes in several different colors to ensure you find just the right shade. It is also an eco-friendly product to ensure that your beauty product is as clean as it is natural. Keep in mind that the color you select may vary from the color you receive. Also, you might want to prepare your lips before applying the lipstick to avoid issues with the somewhat chalky texture. Otherwise, this all-natural product is a great option if you are looking for a creamy color palette and great, long-lasting coverage. Once again, it is a much safer bet to avoid using lipstick products that contain parabens. You run the risk of accidental ingestion should you lick your lips or transfer your lipstick to food and beverages you eat and drink. Huff Post reports that on average, women consume approximately seven pounds of lipstick in their lifetime. That could be seven pounds of lipstick containing harmful parabens and toxic metals. Rather than risking the ingestion of harmful chemicals, it is better to make the switch to a safer, paraben free alternative. Not only can you enjoy the natural coverage, but you can also enjoy knowing that you are more likely to live healthier because of your choice.